Wayanad parliamentary constituency has been witnessing intense political battle, especially after the announcement of Congress President Rahul Gandhi’s candidature from Wayanad. 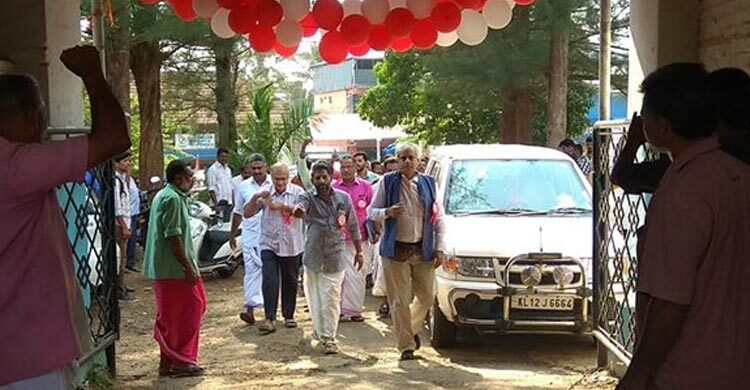 On Thursday, thousands of farmers from various parts of Wayanad came to Pulpally, once infamous for suicides of the farmers, to participate in the ‘Farmers’ Parliament’ which was organised in association with the election campaign of the Left Democratic Front (LDF) candidate PP Suneer. The Farmers’ Parliament was followed by a massive rally with a demand for pro-farmer policies rather than the anti-farmer neoliberal policies that help the corporates. The farmers’ rally was organised by the Communist Party of India (Marxist), CPI(M)-led LDF to highlight the distress of the farmers since the economic liberalisation of 1991. The parliament which was headed by All India Kisan Sabha (AIKS) president Ashok Dhawle along with AIKS joint secretary Vijoo Krishnan, eminent journalist P Sainath, Communist Party of India (CPI) state secretary Kanam Rajendran, AIKS finance secretary P Krishna Prasad and other Left leaders observed that both the Congress-led UPA and BJP-led NDA government have contributed to the distress of the Indian farmers. “The agrarian reforms and the economic policy of the Congress has affected the farmers. The BJP is just following the policy of the Congress,” Dhawale said. “Only the Left democratic forces can introduce an alternate policy that opposes the neo-liberal policies, finding a solution to the deepening agrarian crisis. There should be industries that are under the control of the farmers and workers and it would be helpful to ensure decent prices for the produce of the farmers without having the exploitation of the corporates and the middlemen,” the resolution passed by the parliament said. The report of the National Commission on Farmers had been in cold storage in the Parliament for the last 16 years, and the successive governments could not find enough time to discuss the plight of the farmers, Dhawale pointed out. When both the NDA and the UPA have failed to implement MS Swaminathan report’s recommendations including a minimum support price of 50% more than the cost of production, Left parties have highlighted this in their manifesto. So, the parliament urged the farmers to elect a government that is committed to curtailing the farmers’ suicides and agrarian crisis. Tariff reduction and its elimination under the ASEAN-India Free Trade Area (AIFTA) disrupted farmers’ domestic markets as well as reduced their bargaining power, and led to a fall in domestic prices as the supply of agricultural and related semi-processed (and processed) products has been increased. For example, though India is the second largest exporter of pepper behind Vietnam, the import of cheap, low-quality pepper from Vietnam and Sri Lanka has caused a drop in prices of pepper in the domestic market. “There was time, we have got more than Rs 750 per kg of pepper and then the prices began to fall,” said a pepper farmer from the Wayanad. Over the years, the prices have dropped further,” said Dhawale. In Kerala, Wayanad has a large area under pepper production. Once the pepper prices had started to fall drastically, the district, especially Pulpally, turned into the graveyard of farmers. More than 80% of Wayanad population depends on agriculture and the agrarian crisis has hit the livelihood of the majority of them too.